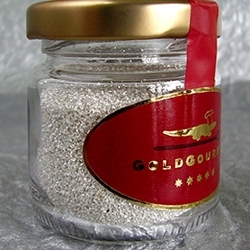 Gold Gourmet Edible Silver - This metallic silver dust is made specifically for the food industry. It's perfect for decorating holiday cookies, wedding cakes, or anything that you want to prepare with the real glow of silver! This glass jar holds 1 gram of edible silver dust. Imported from Germany.